40 days (spring), 80 days (fall). 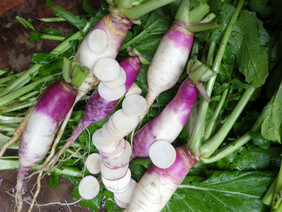 Long white turnips with purple tops. Productive dual use variety widely grown in Portugal for fodder as well as great eating for the winter table. Pkt (3 g).